The mascara we don't want to smudge, can be a real pain to get out of your sheets and pillowcases. 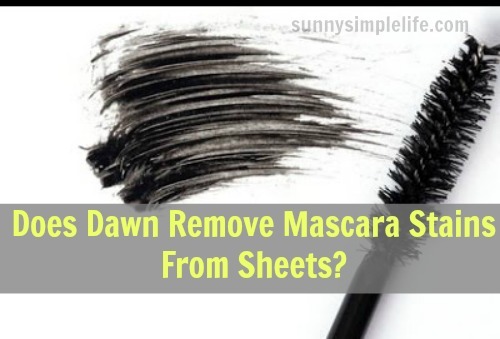 I decided to test a tip I read that Dawn can remove mascara stains from sheets and pillowcases. Here are my results. Sheets are expensive to I am determined to find out how to remove mascara stains out of my sheets. Follow along as I find the secret. 1. I slightly dampened the makeup stain on my pillowcase and wiped lightly. 2. I then put the original blue Dawn on the stain rubbing in well and let sit to work. 3. Using an old toothbrush I scrubbed the stain after an hour of sitting. 4. Placed the pillowcase in the hot washer with laundry detergent and washed as usual. In a word no! I tested this tip and though the Dawn did fade the mascara stain, it was still there after washing. I am onto the next test. I am going to find a way to get these stains out and save our sheets! Try the Dawn and vinegar mixture. I use this to remove jet grease from my son's uniform pants. I have had good luck with it. Good luck!